Torn between steak or seafood? Right now you’re in luck, because with our special edition Surf & Turf pizza, you can have the best of both worlds. This saucy little number combines a Tonkatsu BBQ base with sizzling prawns and Picanha steak – and trust us, it’s a marriage that actually works. To complete the perfect partnership, we’ve added fresh capsicum, Spanish onion and a drizzle of our tangy house-made lime & ginger aioli. 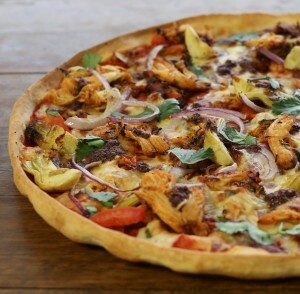 Seriously seductive, this is one pizza we strongly recommend you get to know. Just don’t get too attached – after all, the Surf & Turf is around for a good time, not a long time! What’s Picanha steak, we hear you ask? 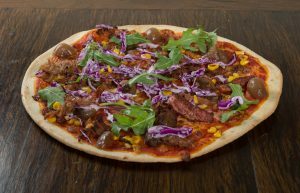 Well it’s one of Brazil and Portugal’s best-kept secrets: a prized cut of beef that stays tender even under extreme heat (making it perfect for our fiery 270-degree pizza ovens!). Marinated in our signature pepper and garlic recipe, it’s a must-try for flavour aficionados. What’s your pizza based on? It’s no secret that the base is the most important part of any pizza. Crispy on the outside, soft in the middle – we’ve been perfecting our regular base, dough-ball by dough-ball for a lot of years and we’re pretty happy with it. 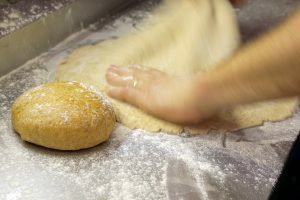 Despite this we were hearing from some of our customers that they loved our pizza but they just couldn’t eat wheat, wheat, wheat with every meal anymore, so a few years ago we began tinkering with a new kind of dough. 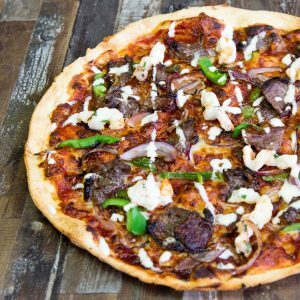 How to make a Spelt Base Pizza that tastes great. After a lot of experimenting our pizza geniuses came up with a unique Spelt Base that we still use today. We settled on a combination of 100% Australian Spelt and Wholemeal Flours, Honey, Sea Salt, Herbs, a dash of Yeast and a drizzle of Local Olive Oil to create a base with a delicious, mild nutty flavour. 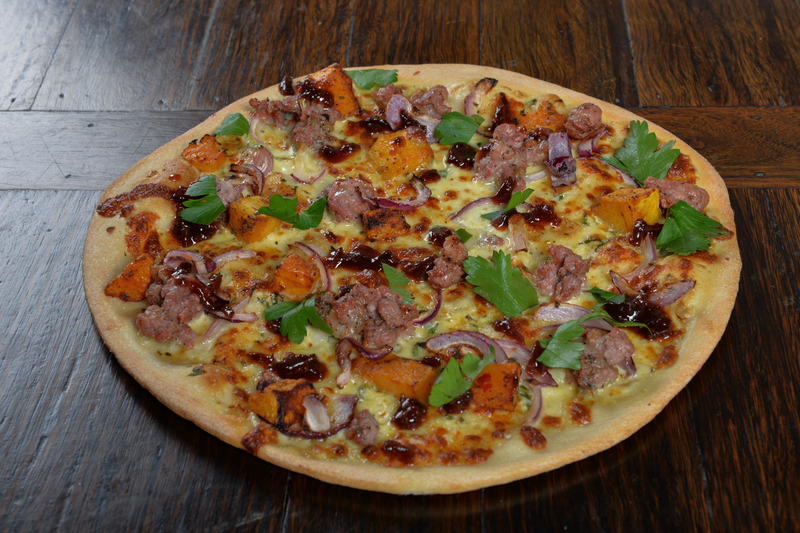 It’s a great match for our Lola, Maple Beef or Capricciosa pizzas. Or, if you’re a fan of our Garlic and Cheese breads ask for one with spelt next time. That’s what our spelt base is really all about – feeling better. If you’re one of those people that feels a bit bloated or your tummy’s not happy after eating too much wheat, then you should definitely give spelt a try. The coolest part about spelt is it’s easier to digest. It has high water-solubility so its nutrients are absorbed into the body more easily and quickly. It also has a lot less gluten, and the gluten it does have is different. Gluten is often the binding agent in baked products. It affects foods texture by making it more elastic, less chewy. For example cake has less gluten than bread. When you eat food with gluten your digestive system has to break the bonds the gluten has formed. Spelt gluten is more fragile than that in wheat. Think about how as you keep mixing wheat dough it gets tougher and tougher as bonds form. Well, with spelt dough the more you mix, the more it falls apart. Bit harder to make, much easier to eat. Spelt flour is not gluten free, so it’s certainly not suitable for anyone with celiac disease or a serious gluten intolerance but for our customers that usually have to think twice about having a wheaty pizza, it can make a big difference. Spelt grain is part of the wheat family but it is different from so called ‘Common Wheat’. Common Wheat has been cultivated by humans since around 10,000BC. That’s a long time – Australia was still connected to Papua New Guinea back then – and in the 12 millennia since, wheat has evolved due to ‘human’ selection to become the seriously versatile food that allowed civilisation to develop into the 21st century. Spelt is old too. It first popped up in about 8,000BC but didn’t take off in quite the same way. In the great battle of wheat vs. spelt, wheat’s most significant advantage was its softer husk, which made it easier to harvest. In 1800 spelt was still pretty common in Europe and Britain but by the middle of that century, when the mighty combine harvester was invented, wheat became king. A hundred years later spelt was almost forgotten, but I’m sure you’ve noticed, it’s come back in a big way! We’re well and truly in the middle of winter now. It’s time to settle in for grey days and cosy nights. Luckily, we’re prepared. Our delicious new winter wonders have been specially created to keep you warm on the inside, and our Rocket girls and boys are rugged up and ready to deliver them to the comfort of your couch. We hope you like devouring them as much we did creating and tasting them. We always want more, more, more Free Range Chicken and these juicy Buffalo Wings have been calling out to us for a while. 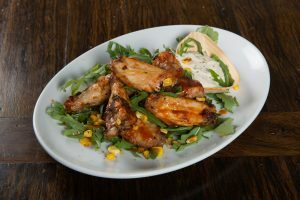 An authentic Southern Hot Sauce marinade with our house-made dill, chive & lime ranch dressing will warm up your bones and have you licking your fingers. 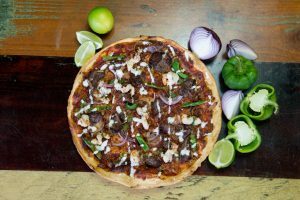 We’ve been getting great feedback about the Pulled Beef Brisket in our Fajita pizza so had to make you guys another beef pizza. You’ll know this flavour combo from one or two pubs and burger places lately, but that doesn’t make it any less delicious! Wild Aussie Prawns are another topping you guys can’t get enough of, so here’s something a little bit classic and little bit different. A creamy Napolitana style sauce with garlicy Wild Prawns makes this one taste a bit like an old-school Seafood Marinara (only on a pizza). Give it a go – we think you’ll be pleasantly surprised . 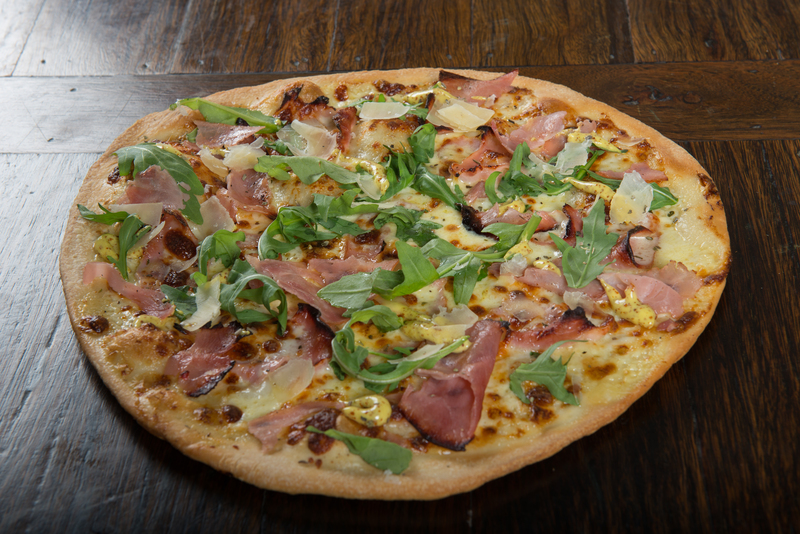 This is one of our Cream Sauce base pizzas that always get a crazy-loyal following. It’s almost all House-Made (Fennel Sausage, Sage Cream Base, Chilli Pumpkin, Beetroot Relish) so this is a very Rocketboy pizza. This is for the young and old alike. 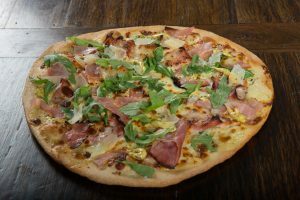 A simple combination of 4 cheeses, Dijon mustard and our awesome Smoked Leg Ham will hopefully make this French inspired classic a new family favourite. That magical meal, somewhere around the middle of the day that is limited only by your imagination. Let’s say you forgot your lunchbox, what are you going to do? If you’re after something versatile, that you can eat hot or cold. Something you can slather in meat or veg-it-out, fold it or knife-and-fork it, then Rocketboy is for you! Here’s what makes Rocketboy pizza the best lunch option since sliced bread. You can make it fit (almost) any weird diet you’re into: No meat, no dairy, nothing purple, nothing from Tasmania – No problem. If your belly has rules, our pizza is usually pretty chill. It can roll with it. Everybody from Game of Thrones loves pizza for lunch. Apparently, the entire cast and crew of Game of Thrones have pizza for lunch every day. It’s made by one of the dragons that doesn’t get as much screen time as the others. True story. We deliver goodness. Sustainably-fished Wild Prawns, Free Range Chicken as standard, delicious veggies, sauces and marinades made in-store. Rocketboy is pushing best-practice food as far as we can. Pizza makes friends. When someone sees you eating Rocketboy their taste-buds will draw them hypnotically towards you. They’ll sit near you, make a little chit-chat and then, if you offer them a slice they will love you. FOREVER! Left overs. Even pizza-rookies know that you should always order a little extra. Then, around 4 O’clock, when your unfortunate colleagues and flatmates are pulling out Saladas and protein shakes you’ll have the power of pizza to draw on, with all the wonders that it brings. It’s been a little while, but Rocketboy is back with a few new treats for our friends. 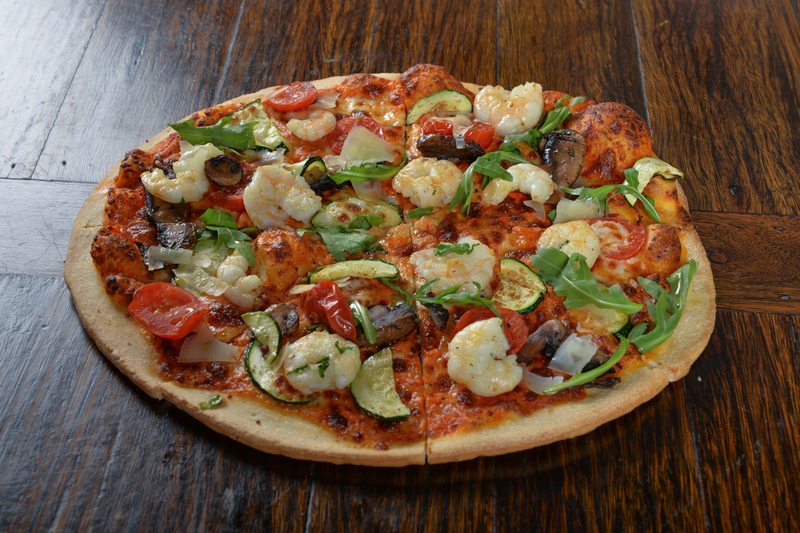 After many a morning tinkering away in our pizza kitchen we’ve emerged with 3 new flavour combos that we love! We’re quietly confident that you will too. Like a lot of you we’ve been a little obsessed with our slow cooker this year. What better way is there to do beef!? 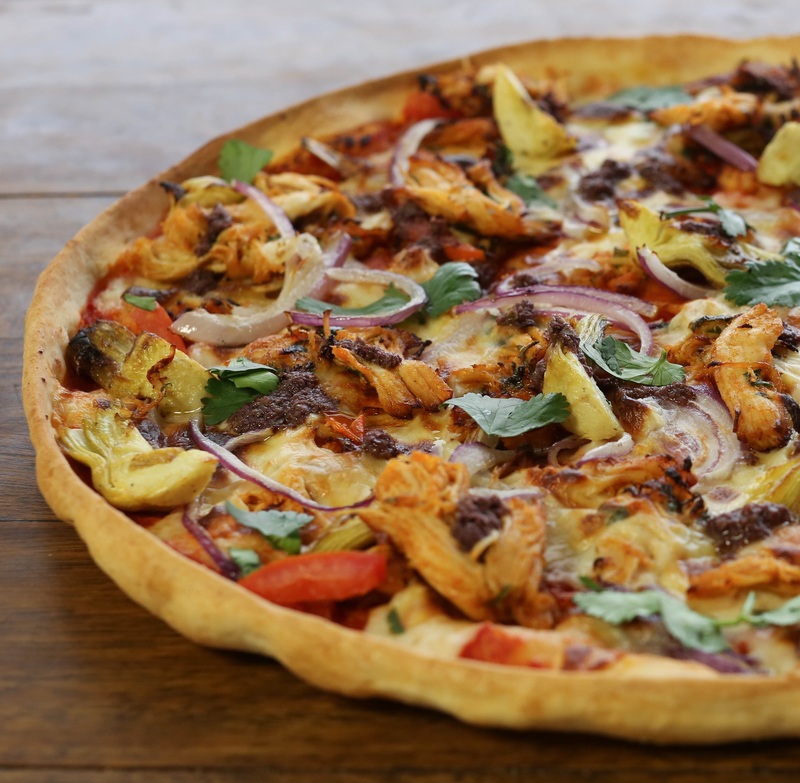 This Mexican style pizza does it beautifully. 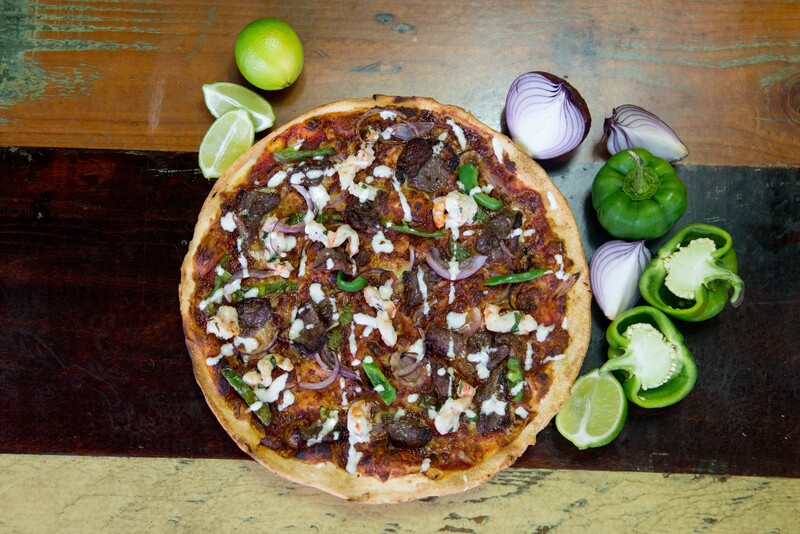 We use Organic Beef Brisket from NSW, bursting with the flavour of Coriander, Chilli and Lime. 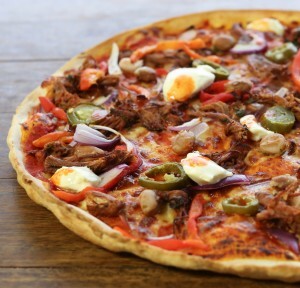 The Fajita has ‘menu star’ written all over it! Our Brazilian buddies, working and eating in our Maroubra store helped come up with this one (special nod to William B). Authentic family-recipe paprika chicken with a very Brazilian cream-cheese style sauce. Yum! Falafel – one of the world’s favourite foods, and ours. 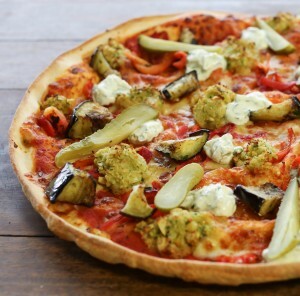 We’ve dressed it up with some of its best friends from the Middle East and Mediterranean. A veggie pizza that gives you the health kick and fills you up too. Seems like only yesterday that we kicked off the Rocketboy story and the view from the kitchen has been one I have greatly enjoyed! 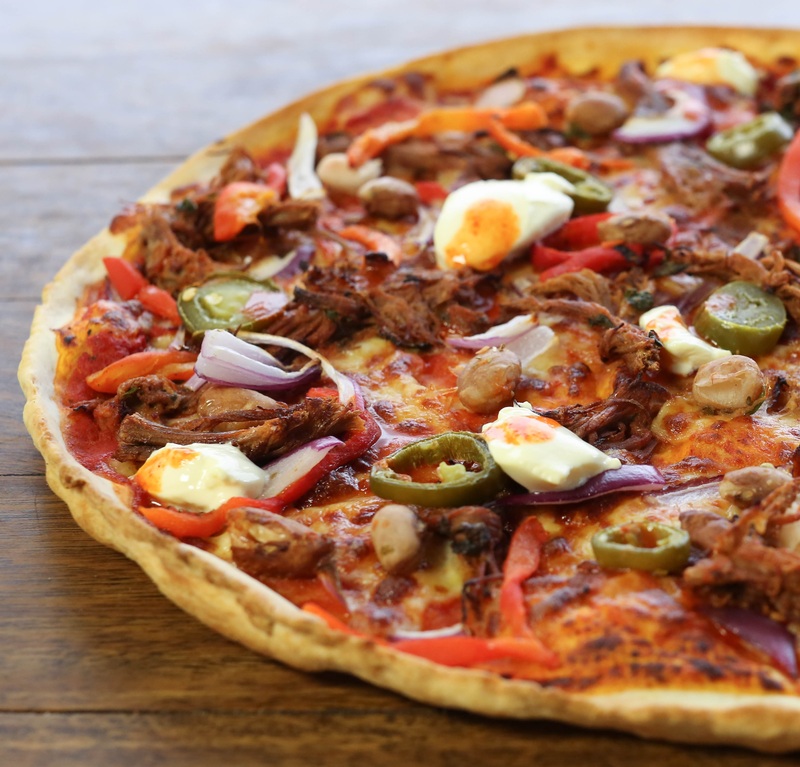 We wanted to see how far a pizza business could go in terms of trying to be more ethical and we wanted to bring better and healthier food to the takeaway pizza market. In terms of what gave us the extra confidence to fully embrace this direction, we have to give huge thanks to Matthew Evans AKA ‘The Gourmet Farmer’. Calling us up back in late 2013, Matthew got us involved in his campaign to steer businesses and consumers away from imported seafood like the prawns we had been using at the time. Having agreed to be a part of this process, we soon learnt of the destruction this industry is causing and to say Matthew had our attention would be an understatement. We are creating barren sea beds around South East Asia by ‘bottom trawling’ to make prawn feed, destroying the mangroves and their eco-system for their farms and eating suspect chemicals added to the water to satisfy our desire for this once luxury – and apparently healthy. So the seed was sown and a spark was lit. For me personally as the Head of Product I thought about all the products we use and how we would blindly call our supplier as we did with prawns and bought whatever they would have on offer. None of us really understood the implications of making these “cost effective” purchase decisions, but with the help of Matthew, we can now be more responsible for the consequences. I spent time at the fish markets and spoke with sustainable fisheries around Australia to pull off the change to Northern Territory MSC certified Wild Aussie prawns. I was hooked into this exciting new side to life at work, and luckily my partners were all on board to make the change and do something different. Bottom line, a tastier prawn with no baggage just had to be done! It has to be said though that having done all this, you kind of expect this groundswell of goodwill and the phone to be ‘off the hook’ all of a sudden, and then you remember that it’s just a small – if not important – incremental improvement that you make all the time on your business. You start to ponder ‘man it’s still a chicken we are eating…it’s not like we just all went Vegan and solved global warming!’. Then finally in late 2014 Matthew’s Doco ‘What’s the Catch’ aired on SBS and BANG for a week there it felt like we had done something special!! The power of TV and a compelling story that really caught people’s attention hit home and we felt buoyed by what was surely our highlight of the year! Check out Episode 1 of ‘What’s the Catch’ HERE! Whilst we had a lot of other changes going on last year, like switching to Hunter Valley Olive Oils and Vinegars instead of imports, from San Pellegrino to Australian Alps Water and making way more of our products fresh and in house daily, the main other product change I have to mention was the massive operation of introducing a ‘Cold Fermentation’ step to our dough, which I just love! This has seen us make our regular and wholemeal spelt doughs at least 24 hours in advance to let them develop in the fridge for this extended time. The result is a dough that has fully developed in terms of the yeast development and the effect is a super light, tasty and what you might not realise, an easily digestible dough too! So if you ever wondered why a Rocketboy pizza leaves you feeling so much better than other pizzas you’ve had, this will be a big part of it. There’s a bit of food science we could all delve into but perhaps that’s for another post and it’s time to wrap up this trip down memory lane. Safe to say that this improvement and many other changes have pleasantly punctuated my year in the Kitchen at Rocketboy and made my job so much more interesting and challenging too! Growing up on a small livestock farm with abundant organic vegetables to boot, I guess my roots were in this journey but having wet my appetite in this first year as Rocketboy, the challenge is set for year two to see what else we can bring to your table! Thanks for reading and thanks to everyone who has supported us on this journey so far – I’ll be sure to keep you posted!